When is the last time you did something you knew better than to do…but did it anyway? My answer is yesterday. Yesterday I stuck my finger into a horses mouth while his mouth was open. I know better than to do that. I know the proper way, and when, to reach into a horses mouth to check their teeth…and I followed none of it. I guess this happens in other areas of life, like touching something hot when you really knew better, but it still begs the question; why? Maybe I was mentally distracted, tired, or just not thinking. I don’t know. P.S.-typing is a total pain…in more ways than one! ← Work easy horses as much as the hard ones. Just the other day I was leading two horses and one of the lead ropes was dragging so of coarse the left horse stepped on the right horses lead and the right horse jerked his head up and smacked that side of my face so now I have a black eye and funny thing is as soon as it started dragging I knew something was gonna happen with just my luck. One of our classic dumb actions was at a large trail ride in Virgina. We tied a horse to our trailer too long. Thinking we were being kind so the horse could eat. 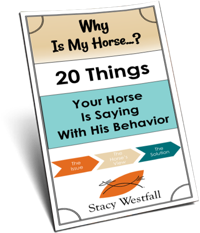 The horse caught the lead rope under the rear trailer door lifted his head panicked, and flipped the back door off the hinges into the air, our horses scattered. The irony here is we were the last trailer to pull out of this field, the door was massively heavy and it took nothing but shear brute force to get the door back on the hinges and luckily no one got hurt. You would never have believed how far the door flew. Big lesson learned, never tie a horse long. What is the general consensus on wearing jewelry (specifically rings) when working with horses??? Stacy your awesome even when your human!!!!! Most horse accidents can be traced to human error. We live and learn and hope by teaching others through our experiences that we can save some wrecks. Even so, I sometimes brake the rules and can’t resist a horse kiss or two. Hope you don’t loose that nail Stacy…Ouch! Just 2 days ago, insisted on sitting on my horse while he was eating in his stall, tried to jump up, didn’t work, I ignored his nervous walk around his stall each time I tried to get on, grabbed a bucket and jumped on, he took off in a frantic circle and bucked, off I went hit my head on the stall wall and broke my shoulder, Yes I knew better, I didn’t listen. I had to take his temp and I knew he doesn’t like it but I was in a hurry and he pinned his ears and then he squealed and I just ignored him so he kicked me into the groin.. Not too hard, I was lucky just a big painful bruise and 5 stitches where the shoe cut through my jeans. It was entirely my fault for being in a rush and ignoring his warnings. Lol. I did that exact same thing back in March and my finger looked almost identical! Feel better soon! I smashed my pinky in the roping shoot because i got lazy and decided i could do it without getting off my head horse. It throbbed all night and kept me from sleeping. In the morning my dad said my nail was not long for this world, but for the time being i needed to burn a hole through the nail to alleviate the pressure of the blood blister beneath. I was like, “Sure that’s what I’ll do, ARE YOU KIDDING ME?” Well the pain finally swayed my decision and i found myself at the cook-shack the following morning asking the woman for a hotplate and a safety pin. I was entered in the roping and i couldn’t even shake out a darn loop, and saddling my horse was completely out of the question! I’m not sure how i found the guts to burn the hole, oh yeah, cause IT HURT SO BAD, but I did what dad said, AND ONCE AGAIN DAD HAD THE RIGHT ADVISE! I had to burn through it a second time once the blood clogged the first hole and believe me i was glad to do it! And yes, just like my father said it would, my nail finally did depart from the end of my finger. The process is long and not pleasant, but this to shall pass. God luck cowgirl, you’re the best! Thanks for always sharing your, your, down to earthness. I let my horse take peppermints from my mouth. Once I let take an altoid from my mouth. When I reviewed the video I saw that she used her teeth to get the altoid. No more altoids. If your nail come loose, cover it with a tea bag and superglue, works great. Thanks for reminding me that we are all human! 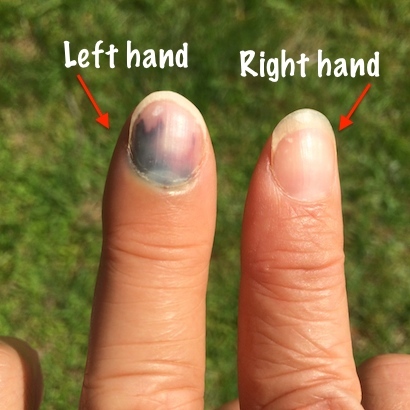 you can take a syringe from your equine first aid kit and drill a hole through your nail just below the mid-line. That will allow the blood to drain and relieve the pressure. There is also a possibility that you will save your nail as it is the pressure from the blood blister that pushes it up and off your finger. I love the transparency of your post and I’m glad your poor finger is, for the most part, ok! My last fail was tieing one of my mares to a moveable object. 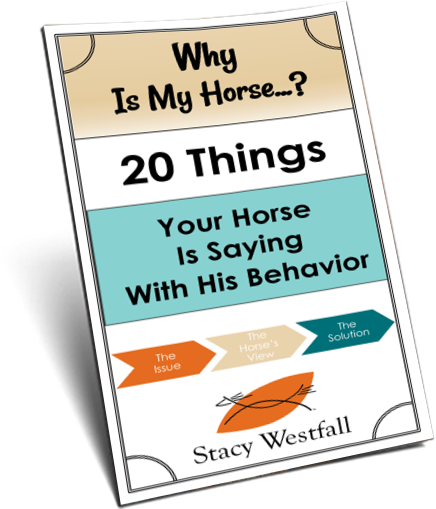 The really ironic part is that the day before I made my friend solemnly vow that she would never tie one of my horses to my corral panels. Of course, it’s ok for ME to do it “just for a second while I change out of my boots!”. I had one boot off and watched in horror as my mare reached down to try and sneak a blade of grass. The lead line slipped behind her ears and over her poll. I held my breath (and my boot!) and watched in horror as she slowly raised her head, felt the added pressure, tried to flick her head away which pulled the panel she was tied to forward. This spooked her and she backed up rapidly, dragging the panels with her. My other mare, who was IN said panels, took the opportunity to dart out the opening which had just been created. Now I had a loose horse, and a horse that was frantically trying to escape the corral that’s chasing her. By some miracle of God she quieted when her rear end bumped up against the paddock gate. I carefully approached (sans right boot!) and loosed the lead rope. 2 loose horses and my one-boot-self made it through with nary a scratch. Thank you, God! And thanks for the lesson in humility…my friend was in the paddock next to us and witnessed the whole thing!